I’ve just been on holiday with a friend and wanted to take her for lunch to say thank you. I wanted somewhere that would extend the holiday mood, where the food was good and which I could afford on a teenager’s budget. 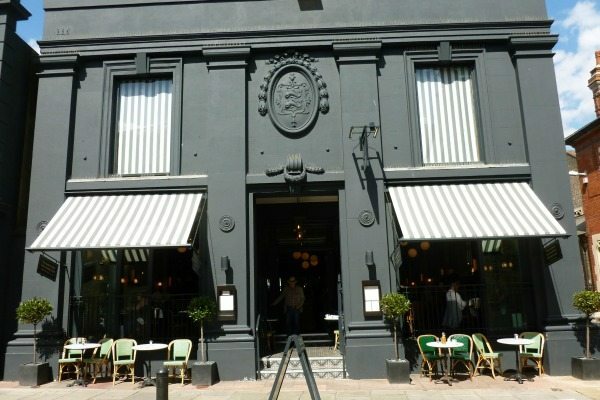 I chose Côte Brasserie on Church St, where inside, it’s easy to imagine yourself in a Parisian restaurant and outside, in the terraced garden on a warm day, in the garden of an auberge in Normandy or Aquitaine. My friend and I were greeted immediately and shown to a table in the sunny courtyard at the back of the restaurant. 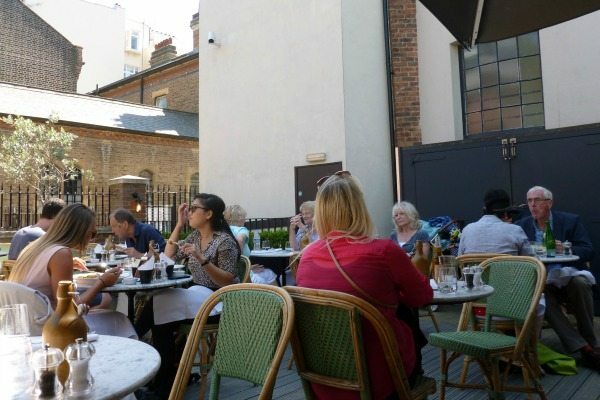 Tucked away and hidden from the busy Brighton streets, the garden umbrellas, marble tables and green wicker chairs to match the olive trees provide a tranquil setting in which we were quick to forget we were in the middle of bustling Brighton. It was also easy to forget we were two 16 year olds on a budget; with so much respect and attention from the staff, we began to feel quite bourgeoisie (to exercise a little of my French GCSE.)! Classy restaurants often aren’t happy to have teenagers ruining their image of sophistication, just by being there, so this was a lovely experience and really enhanced the atmosphere of the place. There are a variety of menus; a la carte, gluten free and the set menu we ordered from which offers a choice of either a 3 course or two course meal. 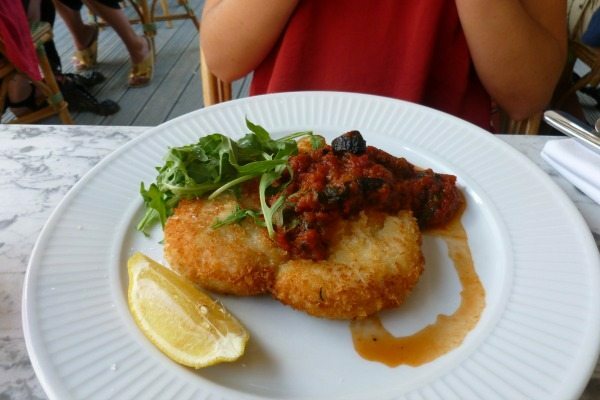 The set menu hosts a very good selection ranging from fish, steak and chicken to salads, soups and Risotto. After 10 minutes of debating these options, we went for the 2 course lunch for £10.95 and both opted for mains and desserts (deciding to skip the mussels and chicken liver parfait starters). I ordered the couscous with roasted peppers, courgette and aubergine with piquant harissa, black olives, yoghurt and mint, while my companion ordered the breaded chicken breast with Provençale sauce, rocket and lemon. The couscous was light and delicious, with amazingly flavoursome veg – I think even my totally anti-greens little brother might approve. My friend too was pleased with her dish, claiming her chicken ‘beat KFC by a long a shot.’ Although the portions were not particularly large we both agreed they were filling and definitely worth the price. In fact, when our substantial desserts came we were relieved to have had slightly smaller mains! 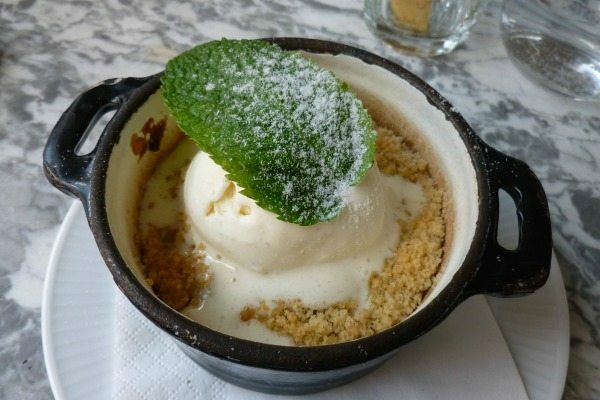 I would like to have had everything: the chocolate pot, crème caramel, iced berries with white chocolate and ice creams but in the end I chose the “Crumble aux Pêches.” This was made up of warm, sweet peach compote, topped with a buttery crumble and triumphed by a scoop of vanilla ice cream melting down into the fruit. 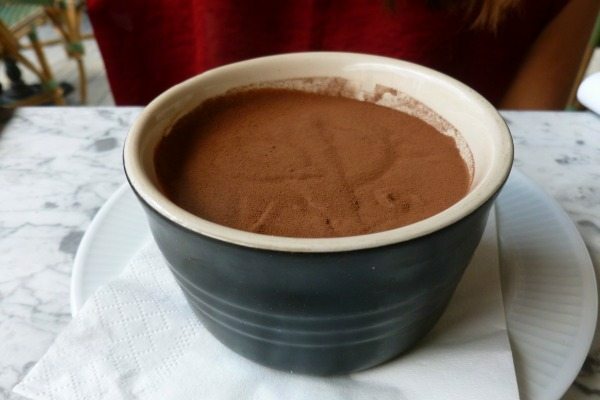 Halfway through her rich chocolate mousse, my dining partner said she was full but both our puds were so delicious that we scraped the dishes clean. For a high-end restaurant with truly excellent food the prices are very reasonable. 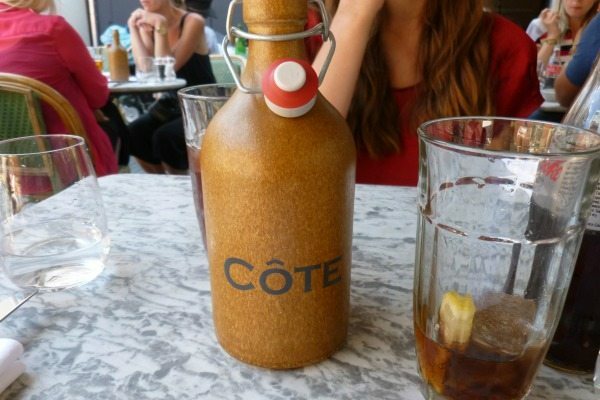 The set menu is a brilliant option for young people, making Cote a a great choice for a thank you, or a birthday meal perhaps, or just a little treat. I would definitely recommend it to my peers and am already planning my next visit with a group of friends on exam results day – fingers crossed that there will be something to celebrate! Cote is a popular French Brasserie chain in central Brighton. Our resident teen reviewer Kitty, enjoys the friendly service and menus choices.